A Polar Bear blocks the way for vehicles at the Churchill Wildlife Management Area in Churchill, Manitoba and must detour if they find themselves in a hurry. 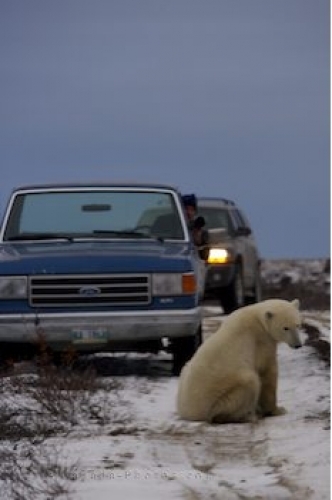 A Polar Bear casually sits on the roadway in the Churchill Wildlife Management Area in Manitoba, Canada while tourists to the area stay in their vehicles and take pictures. If this polar bear decides to hang around here for any length of time, the vehicles will have to find a detour route to continue on. Picture of a Polar Bear in Churchill, Manitoba making tourists detour to get by.